Way back when the Samsung Galaxy S2 was released I did a guide on stopping number from calling your phone. Back then I was using an early release of Ginger (most probably 2.3.3 or even 2.3.2) and since then things have changed quite a lot with most people running 2.3.5 or 2.3.6 (if they've not already gone to Ice Cream Sandwich). This has meant the original guide (which can be read here) is now quite dated and lacks a specific step that we will cover in this guide. actual method isn't much different to the original guide but their are some noticeable differences so lets start with setting screen (in the top left of this guide). From the settings menu you need to select "Call" and then "Call rejection" which is a screen like the screen shot on the left of this paragraph. 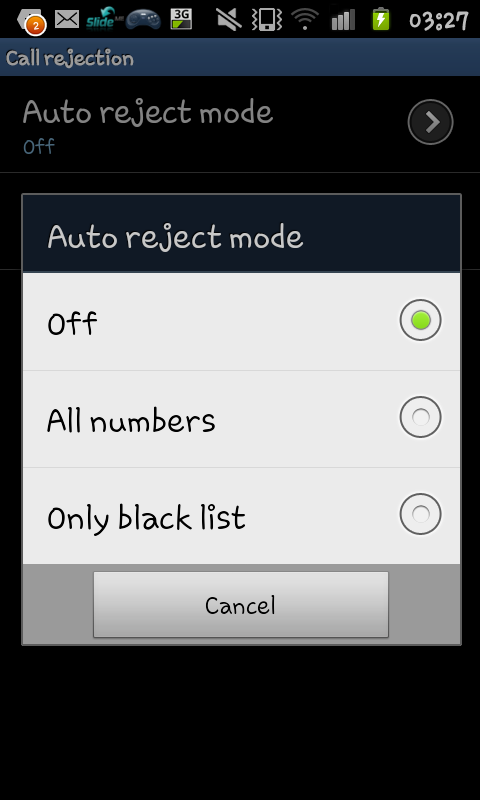 up a menu with 3 options: "Off", "All numbers" and "Only black list". 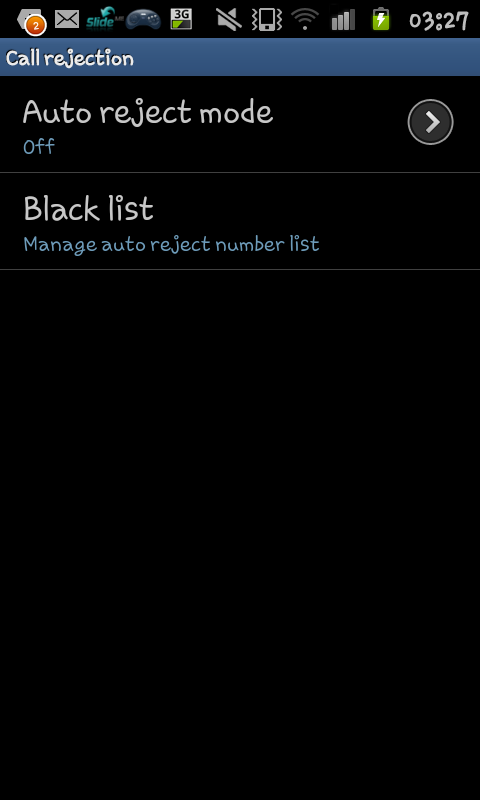 From here you need to select "Only black list". After this the numbers on your black list won't be able to call your phone. What is actually quite annoying is that this step wasn't there in the original version of the software so you didn't need to do that and now you do. After you select a choice from the "Auto reject mode" menu you will go back to the previous screen with the "Black list" option. 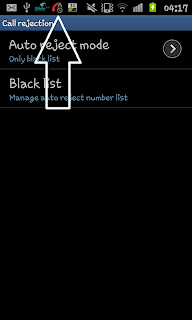 Now you can either click on "Black list" and then click "Add" then add the number you wish to blacklist. 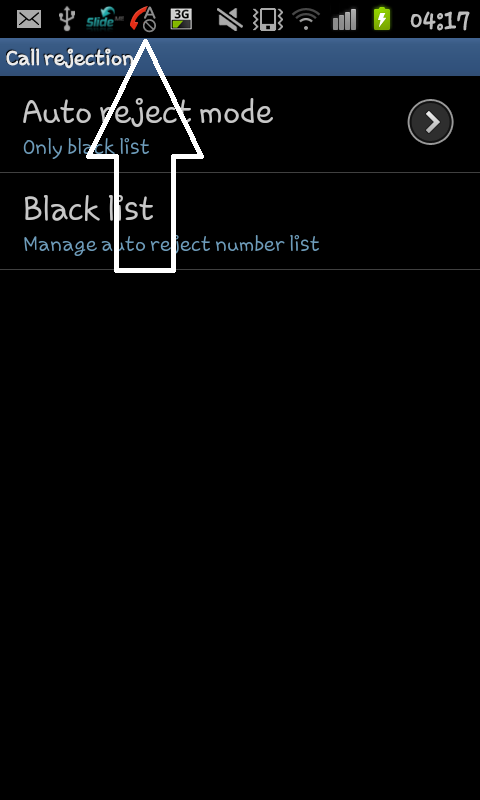 Though it can be difficult to remember a whole mobile number so what I would advise is following the original black list guide (click here) and adding the numbers to the black list via your contacts screen. Note-When you set an "Auto reject" mode you will see a new symbol along the notification bar of a red phone, an "A" and a "No" symbol, this is to say "Calls automatically rejected". The symbol can be clearly seen on the large screen shot alongside this paragraph with a white arrow pointing towards it. This guide should work on any phone running Android version 2.3.5 and this includes the likes of a Samsung Galaxy S2, HTC Sensation XE and many many other. I have the same problem, does anyone know a solution? You may also be able to do a long press on the number in the call log, and there should be an "Add to Blacklist" option. Caveat: I'm running Drew's CM7 custom ROM on an LG Optimus S. It looks like this should be a stock part of Gingerbread, but I can't confirm. I am having the same issue. None of the options through settings or long pressing the number is available. I am also running 2.3.6 with Sprint on a Samsung Galaxy s2 Epic Touch. Not working with 4.0.4. 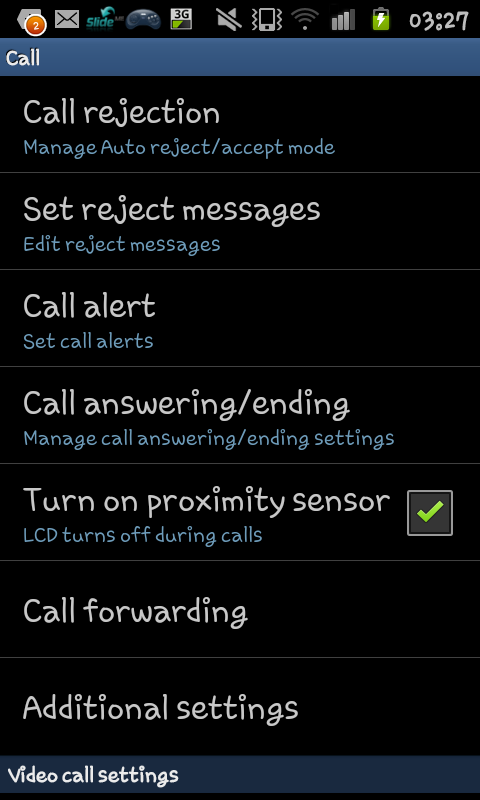 It goes from settings>call settings and no blacklist option anywhere. I can't remove any numbers that I previously put on blacklist. This is extremely frustrating! I have Samsung Galaxy S2 Android version 4.0.4 and like the person above me says, it goes from Settings>Call settings and no blacklist option comes up. Why would they take away this feature???? SO FRUSTRATING! Maybe they want us to use apps instead? 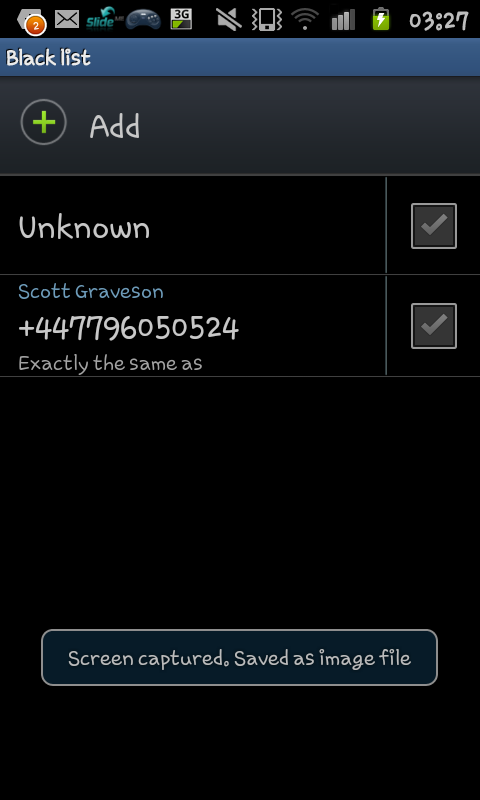 Does anyone have an app they recommend to block numbers and texts on this version of Andriod?